• CONSOL was electric today, even more so than in the past. 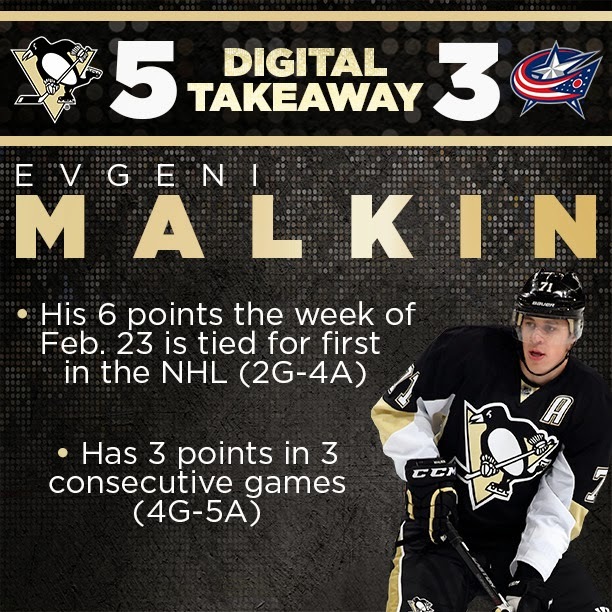 The excitement of a game against Columbus was there and the Penguins did not disappoint. Mass amounts of Fleury chants broke out constantly. • There are always so interesting outfits at CONSOL especially the guy that danced for a Dilly bar in an all blue outfit (including blue nylon that went over his head). All I could think of was “I'm blue da ba dee da.” Okay Eiffel 65 throwback song. • Overall penalty wise the game was tame minus the Tropp hit on Despres. That was dangerous. The crowd really let Tropp know what they thought of the hit, including many, many words that cannot be written down. • Was there a better player on the ice than Malkin? Maybe Pouliot and Letang were close seconds but Malkin got the crowd SERIOUSLY going. • Manny the Frenchie anyone? How cute. Someone knows how to get the ladies going! When he was shown on the screen the crowd went NUTS. He also has an adorable photo with Sidney Crosby. • Pretzel nuggets. I came. I saw the pretzel nuggets. I stuffed my face. They were fantastic.